Skincare, my sometimes enemy and other times best friend. I had a period earlier this year where I became extremely lazy with skincare and it showed. My skin was quite disgusting to put it mildly. I've been trying to make more of a conscious effort with skincare for many reasons and it is something I am interested in talking more about here on Nana Wintour so there's going to be a few posts on the topic this month. Before I begin this post I'll just start by stating the obvious. I am by no means a seasoned skincare professional. My knowledge comes from trial and error, reading books on the subject and the words of wisdom that is Caroline Hirons' cheat sheets. Any products I recommend are suitable for me and my skin type, which is combination-oily typically. My skin can be sensitive though so what works for me, mightn't work for you, particularly if you have dry skin. 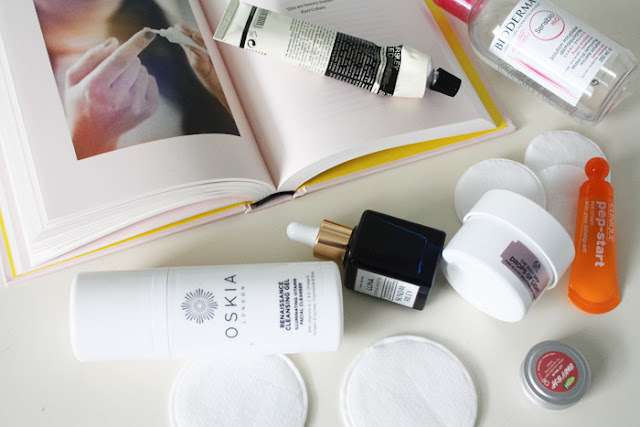 Now we've got that out of the way, today I thought I'd do a post with five things skincare has taught me. Some of these will seem like common sense to some of you but I thought I'd throw them in anyway. 1: All natural doesn't necessarily mean all good. I feel like this will be a controversial statement for some of you because the allure of all-natural products does entice a lot of people. I'm not saying it is necessarily all a gimmick, although in some cases it may be. Just that I have tried and used products from brands that pride themselves on their all-natural ingredients and sometimes they've just exacerbated my skin's problem areas. By that I mean breakouts on my chin and jawline. I've also had to discard a natural eye cream because it irritated my eyes. Natural vs synthetic skincare is a bit of a double-edged sword. If you're ever unsure, try to acquire a sample or tester before you make the investment in a product. Even if you just patch test in store, that can sometimes be a decent indicator. 2: A good face mask is like a good friend. They're hard to come by but worth investing the time in once you find the one. Let's be real, there are a ton of face masks on the market and some of them just seem to do very little but the ones that do work are the best. My favourites that I've used and liked are: Glamglow Supermud, Skinfood Mud Masque, Aesop Parsley Seed Masque and Manuka Dr Peel Off Face Mask. 3: I like the odd drink, but my skin hates alcohol-based skincare. I don't know what it is about skincare that contains concentrated alcohol as an ingredient but my skin absolutely hates it. I think it's used quite a bit in skincare because it's quite a cheap ingredient. For things like blemishes it will dry them out but then I find it often makes my skin extremely dry or it will just give me an extreme breakout situation. Not ideal. If you use a foaming cleanser be careful because it can be one of the main ingredients in products like that. 5: Make your skincare routine enjoyable so that it doesn't feel like a chore. Much like removing makeup after a long day, skincare can seem a bit tedious for people, myself included. I know if I am tired I'll just remove my makeup with a micellar water and then not do anything else. Extremely slack! Nowadays though I find I enjoy and look forward to doing my skincare routine each night. I keep it short and brief. You don't need to use loads of products. Just getting in the habit of doing it regularly will help your skin. -What has skincare taught you?